If you haven't visited in a while, I have taken up oil painting. You all know I love repurposing vintage items for my art so it was only a matter of time before I created something fun for my oil paints. There are many artists who use tiny oil palettes created from empty Altoids tins so the concept is not my own invention. I am, however, adding my own creative touches to some old tins I have collected on my junking adventures. 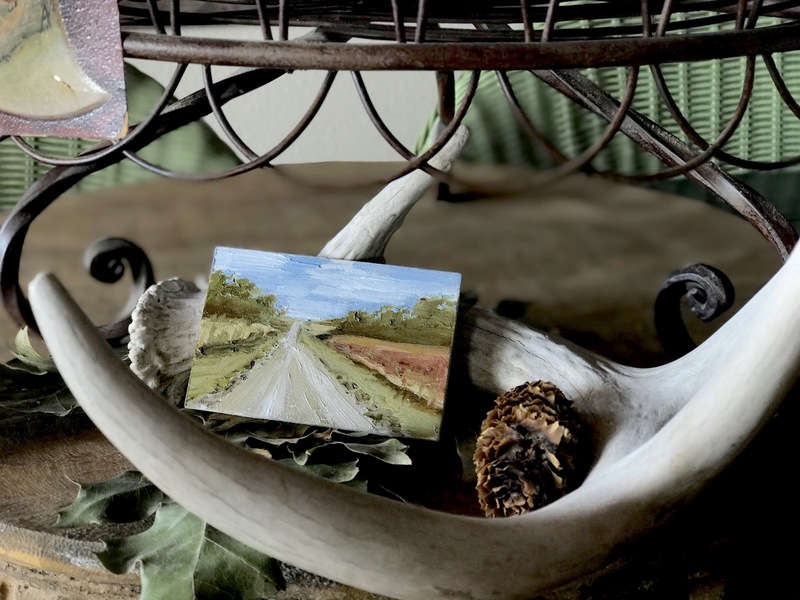 If you have purchased a miniature oil tin from my shop, thank you so much! If you're interested in purchasing one, check my shop out link HERE. Okay let's get started. 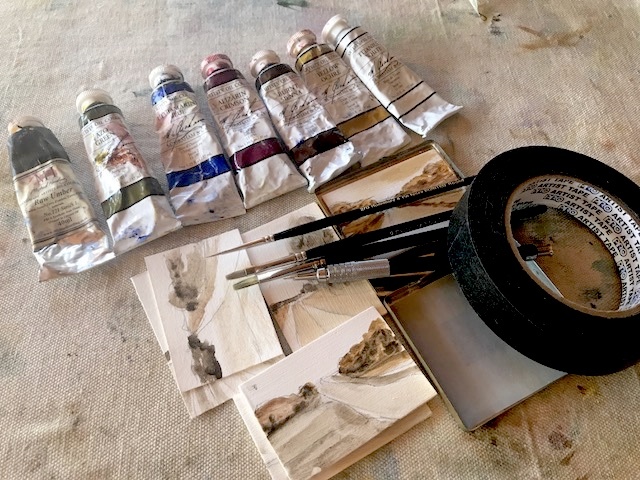 If you purchase a miniature oil paint palette from my shop, you'll receive the vintage tin, 10 pieces of gray palette paper, 5 wood panels and 5 pieces of oil paper. These are all ready to use. For refills, I will add some wood pieces to my shop from time to time and you can also check craft stores or online art stores for supplies. For the paint selection, I always will recommend an artist grade oil paint. Please do not waste your time on inferior student grade supplies. I know they are less expensive but they are lesser quality too because there are less pigments in these paints. Brands I have experimented with and like are M.Graham, Gamblin, Michael Harding, Williamsburg and a few Winsor Newton colors. You will want a very limited palette because the palette paper area is small and you want to leave space for mixing your paints. I used 7 colors here: raw umber, azo green, ultramarine blue, alizarin crimson, burnt sienna, yellow ochre and titanium white. You could certainly mix your own brown and green and leave those off your palette. Other supplies include artist tape for sticking down the palette paper and the painting substrate. I use very small brushes like a 0 or 2 flat brush and maybe a rigger for fine detail brush. You don't need many brushes here because you will work small and the brush is easy to wipe off with a paper towel. 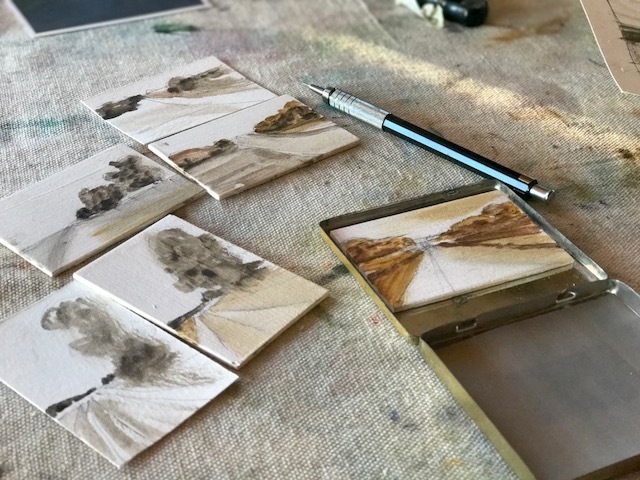 I usually draw my landscape using a brush and some paint thinned with Gamsol but for these tiny landscapes I used a pencil because the lines are finer. You'll also need some Gamsol (odorless mineral spirits)to clean brushes and an oil medium (I use M. Graham walnut oil) if you need to thin any paints. Here's what my Gamsol and oil medium containers look like. Very small so that I can travel easily with them. I'm not here to offer painting lessons because there are so many more artists more qualified but here's my routine. I start by creating an underpainting which consists of using diluted paint (with Gamsol) to block in the main shapes. This is like a value painting, painting in the light and dark areas. Creating an underpainting helps to establish the main shapes and values so you don't start painting with a blank, white canvas. When squeezing out color, use only a tiny dollop. You don't need much. I then add my skies to my painting. This is usually my first step when adding color. Next I add in my darkest darks and move on to the more mid tone areas. You can see I only need a small area to mix my paint. I continue painting, building up the layers and adding final details at the end. I can complete a painting in probably 15 minutes. When starting out, my best advice is to start small and paint often. Using a tiny paint palette and substrates definitely helps to work small. If you'd like to see my 100 Meadows Project, visit my Instagram page at: mishwooderson. I took on 100 meadows in 4 months on 4 x 6 oil paper to get my oil painting jump started. For my inspiration, I used some previous paintings, sketches and photographs. You can certainly work outside in nature, which is called plein air painting. It's my favorite way to paint. Here's a sample of my miniature artwork. I believe art can be made on anything and any size. These tiny paintings are perfect for sharing with friends and relatives, other artists....or just place them in little vignettes around your home for decoration. I hope you've enjoyed this tutorial and if you're new to oil painting, I hope you give it a try. It's not nearly as intimidating as we all make it out to be. If you're an experienced painter, try painting small sometime. It's a perfect way to add in some shorter painting sessions and to keep your practice up. I'll be using my little palette while hiking out in our timber, waiting in the car, at doctor appointments for my mom, on vacation.....anywhere you can set up a few supplies. Enjoy!